As the American Southwest faces its deepest drought in history, this book explores the provocative notion of “water bankruptcy” with a view towards emphasizing the diversity and complexity of water issues in this region. It bridges between the narratives of growth and the strategies or policies adopted to pursue competing agendas and circumvent the inevitable. A window of opportunity provided by this current long-term drought may be used to induce change by dealing with threats that derive from imbalances between growth patterns and available resources, the primary cause of scarcity. A first of its kind, this book was developed through close collaboration of a broad range of natural scientists, social scientists, and resource managers from Europe and United States. It constitutes a collective elaboration of a transdisciplinary approach to unveiling the inner workings of how water was fought for, allocated and used in the American Southwest, with a focus on Arizona. 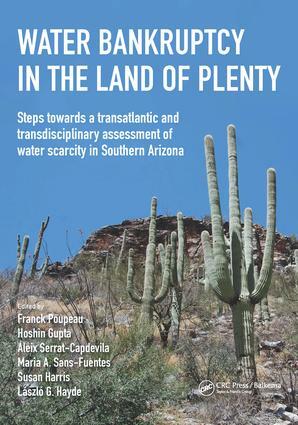 Specifically, it offers an innovative scientific perspective that produces a critical diagnostic evaluation of water management, with a particular view to identifying risks for the Tucson region that is facing continuous urban sprawl and economic growth.